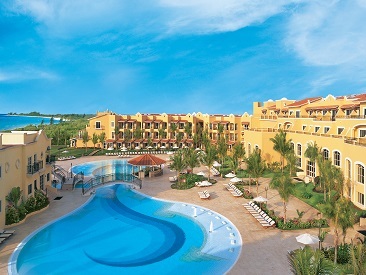 Secrets Capri Riviera Cancun an all-inclusive, adults-only resort in beautiful Riviera Maya. Intimate surroundings set the tone for achieving ultimate rejuvenation. Start the day with a yoga lesson or seaside spin class, indulge in soothing treatments at the Secrets Spa by Pevonia Botanica or learn deep breathing meditation techniques, all at your leisure as part of your Unlimited-Luxury® stay. Then move to savor international cuisine at any of the five gourmet restaurants, complete with dishes to satisfy every taste. At Secrets Capri Riviera Cancun, intimate charm meets rejuvenation to give guests the best vacation experience possible. Rejuvenate. Enrich. Inspire. Secrets Capri Riviera Cancun, an all-adult, all-Preferred Club resort in the Riviera Maya, exudes Mediterranean charm and romance in a villa-style setting. Situated on 71 tropical oceanfront acres in the beautiful Riviera Maya, this all Preferred Club resort provides Unlimited-Luxury® to experience-seeking adults in a stunning, intimate setting. Bordered by sugar-white beaches and the brilliant, crystal clear Caribbean Sea, just 35 minutes from Cancun and five minutes to the shopping and fun of Playa del Carmen, this unique, concierge-style resort was designed to connect your mind, body and soul. Intimate surroundings set the tone for achieving ultimate rejuvenation. Start the day with a yoga lesson or seaside Pilates class, indulge in soothing treatments at the Secrets Spa by Pevonia Botanica, or learn deep breathing meditation techniques, all at your leisure as part of your Unlimited-Luxury® stay. The experience continues right outside your door where you can take a heart-healthy cooking class, discover new photography techniques with our in-house photographer, or learn about local culture when visiting Mayan community members. And if golf is your game, you will love the complimentary greens fee at the nearby championship course. But the journey doesn't end there. Treat yourself to our elegant accommodations, styled with enhanced Preferred Club amenities and Mediterranean-inspired décor. Then, savor international cuisine at any of our five gourmet restaurants, complete with dishes to satisfy every taste. Delight in health-conscious, gourmet cuisine including gluten-free, sugar-free, vegetarian and organic options. 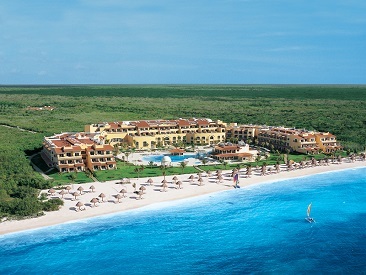 Secrets Capri Riviera Cancun - where rejuvenation and enrichment meet intimate charm, all for you. Treat yourself to elegant accommodations, styled with enhanced Preferred Club amenities and Mediterranean-inspired décor. Then, savor international cuisine at any of five gourmet restaurants, complete with dishes to satisfy every taste. Delight in health-conscious, gourmet cuisine including gluten-free, sugar-free, vegetarian and organic options. The Secrets Capri offers a trendy live jazz club and a piano bar for your entertainment pleasure by night. Close by is lively Playa del Carmen, or take advantage of Cancun's electrifying nightlife one night. Enjoy 4 air-conditioned, gourmet, à la carte restaurants and one buffet restaurant offering Mediterranean, Italian, Continental, Seafood, and Pan-Asian cuisine. Enjoy freshly caught lobster in the water's-edge seafood restaurant. Every meal is an epicurean experience, accompanied by premium brand wines and spirits. As part of the privileges of Unlimited-Luxury®, guests of Secrets Capri Riviera Cancun, Secrets Maroma Beach Riviera Cancun, Secrets Silversands Riviera Cancun and Secrets the Vine Cancun can enjoy reciprocal privileges. The Sip, Savor & See Dining Experience includes complimentary dinner, drinks and entertainment at a restaurant or bar at a participating resort of their choice. Guests can utilize the facilities at the resort they are visiting from 6pm to 1am. The experience is only good for dinner via reservations made through the resort concierge. Guests are responsible for the cost of transportation to and from the resort for a maximum of four people per seating. 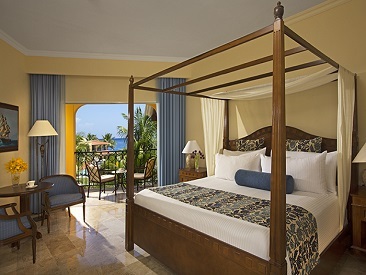 Guests may choose to relax by the pool or along the beach overlooking the Caribbean Sea. Choose to play tennis, go scuba diving off the second largest barrier reef in the world, work out in the resort's fitness center, enjoy a round of golf at one of the nearby championship courses or experience an invigorating spa treatment at the exquisite Spa Garden. Secrets Capri specializes in romance. A grand selection of luxurious wedding packages is available; plus, honeymoon and anniversary packages are available as well. Click on the WEDDINGS tab for complete information about all the enticing ways you can celebrate your love in paradise. At The Spa at Secrets Capri relaxation comes as naturally as breath itself, with a menu of more than 30 restorative treatments and hydrotherapies to choose from, including the resorts one-of-a kind spa garden - a relaxing retreat and the first on the Riviera Maya. This unusual jewel is situated in an outdoor, lush, tropical garden setting and epitomizes the Secrets Capri Spa experience of romance, indulgence, and rejuvenation. 1 door band: "Just Engaged"
This package is complimentary when booking a minimum of 5 nights in Preferred Club Junior Suite Ocean Front or higher room category. Please Note: The use of drones or apparatuses that fly or float in or on the premises of AMResorts hotels is strictly forbidden, except for those that have written authorization from the General Management of the hotel. Secrets Capri Riviera Cancun now welcomes small dogs (under 22 lbs. or 10 kg) in their accommodations and on property. This service is available for $75 USD per night in the required room category. Please contact the resort directly to confirm necessary room category. To reserve a room for a guest with a dog, please email info.secrc@secretsresorts.com. To check availability, you can contact reservations before booking. For full details and restrictions, please visit Secrets Capri Riviera Cancun’s accommodations page.